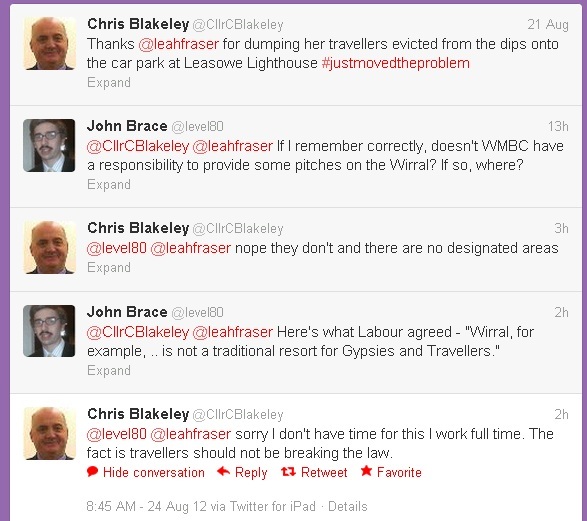 From 1991 to 1994 Wirral Council had a duty to provide up to 15 sites for travellers. The question is where are these sites now? Sadly the law was repealed in 1994. In 2000 Irish Travellers were granted legal protection under the Race Relations Act, which begs the question is Wirral Council moving them on because they’re Irish travellers or because of some lawful power to do so? How much is Wirral Council spending on getting possession orders through the courts against Irish travellers and where’s the public interest in doing so? The ones that stayed in Bidston & St. James near Birkenhead North railway station were only there a short time. I mean the clue is surely in the name, travellers and if you have the patience travellers do move on, it just seems heavy-handed to waste scarce taxpayer resources to compel them to do so or force them to do what they already have done.